Please let us and others know how we did. Please leave us a review! Current Reviews Being Collected by Google. Angela was very kind and friendly. She used the ideas that we had and turned it into a beautiful, yet short (what we wanted) ceremony. I would highly recommend her to anybody looking for a professional, courteous officiant. Very reasonably priced, and was willing to make our ceremony what we wanted. Loved working with her! Angie was great and put us right at ease- and our day was perfect! 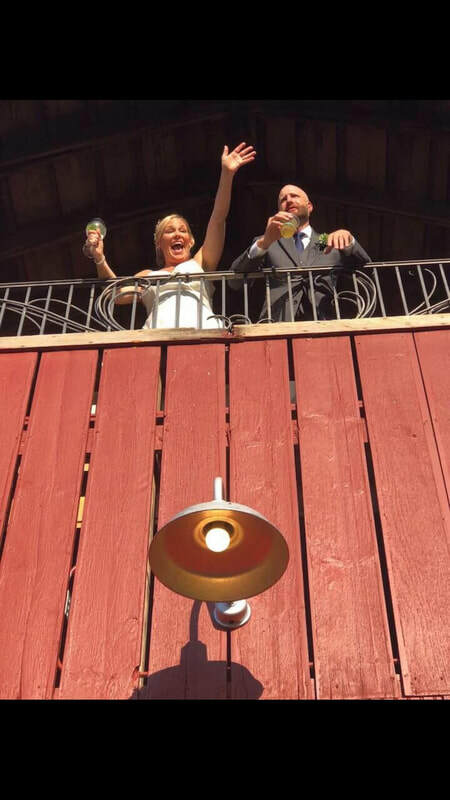 Angie performed our wedding ceremony last weekend (Oct 18th) and we could not have been happier with how things went. We wanted a ceremony that was unique to us and a little different from the traditional ceremony. Working with Angie made the entire process very easy. Using the worksheets she provided we were able to get a general idea of how the ceremony would flow and where we could customize it. Then at our final meeting before the ceremony we worked out all the details. Angie was great at helping plan the details from the order people would walk to suggesting what would be a great entrance for me (we were a little clueless). And when the big day came we were amazed at how well the ceremony was tailored to us. My husband is a huge Star Trek fan and she was able to work that in, as well as coming up with a beautiful and fitting lead-in to our unity ceremony of building a Lego heart. We would definitely recommend Angie to anyone looking for a very personal ceremony!! Angela married my husband and I last November. It was an amazing experience. She was very professional and performed the wedding exactly how we wanted it. Our ceremony was very short about 10 minutes or less total. We got so many compliments from our guests about how personal it was. I would highly recommend Angela!! My husband and I can't express our gratitude to you Angie! One of the major things we wanted when planning out wedding is for ceremony that was touching and full of love. You helped us achieved just that. You gave us the greatest gift on our wedding day of an amazing ceremony full of love. Our guests commented several times how great you were and how wonderful you made the ceremony. To all the brides out there who want their ceremony to be touching and heartfelt I would defiantly go with Angie! Angela was wonderful to work with! She stayed in contact with us before the wedding and did an amazing job at our wedding! We are so glad that we decided to go with her to officiate our wedding! I got to do it my way! Any changes I wanted to make only needed a mention and that's how it was, exactly how we wanted it to be. Angie is so easy to work with, and makes sure you have all your bases covered. Although, she disappeared before I could thank her! Angela was very prepared and organized from the start. The wedding preparation folder she mailed us was a valuable tool for planning our ceremony. Only complaint was that our ceremony was delayed due to our DJ who experienced technical difficulties. As a result Angela "rushed" through our ceremony in order to make another appointment that was booked right after our event. Overall I would recommend Angela's services.